OH! That sounds so fun! Can you decorate my house one day? People go to college for that? I’ve even met someone from a different country who told me if she told her parents she was studying interior design they would laugh because it is just a hobby that anyone could do. It seems as if everyone has an opinion about interior design but few truly understand what it involves. Once you say “interior design,” it is as if people see this fairytale world of fancy colors, extravagant decorations and people having fun picking out fabrics and throwing glitter around. People rarely consider the science and programming that is necessary to create a fully functioning building. So, what IS interior design? In order to understand what interior design is, we must understand what interior design is NOT. The biggest misconception with people thinking that the field of interior design is easy and pointless is that most people think interior design is all about making a space look appealing. In reality, interior design is only 10% aesthetics (decoration) and this is only a finishing touch to the overall structure after several other architectural factors have been considered. That massive stadium your favorite sports team plays at, all of the buildings that make up your city’s downtown, the hotel you rush to book, the building you work in, the school you go to, the hospital you visit, your favorite store or car dealership, the apartment complex you rented and every other building you go into on a daily basis required the knowledge of interior design to be built. One of the first things that is emphasized while studying interior design is that “form follows function.” This means the way a space looks is not as important as how the space functions. I doubt that someone will care that the furniture looks great with the flooring if the space is designed in a way that makes particular tasks difficult and inconvenient. For example, have you ever been in a restroom where it is difficult to exit the stall because of the way the door swings? Have you ever been in an auditorium where hearing was difficult because sounds echoed or were drowned out in a way that could have been avoided with the proper finishes/design considering sound quality? Have you ever been in a work space where two people cannot comfortably maneuver in the space because the space planning didn’t consider the different tasks that needed to be completed in the space? Have you ever been in a building and poor lighting choices/angles made seeing certain things difficult? Have you ever been in a theater and could not hear your movie over what was playing in the room next to you? Likely, the answer to the latter is no. This is a design factor that had to be considered to enhance sound quality. When you have a space that is designed in a way that makes tasks more difficult, or uncomfortable, this is frustrating and ultimately a sign that a designer did not consider functionality in certain aspects of the design. There are way more design factors to consider when it comes to constructing a building but ultimately, interior design is about architecture and functionality more than it is decorating. With that being said, of course a designer should have a great eye for aesthetics (decoration) because once all of the important factors of a space that most of us do not notice are completed, a great look is just the icing on the cake to tie in the overall design and make it memorable! I love this and feel the same way. I sent my daughter to Harrington School of Art and Design. I know how much work there was to do and also to learn in order to be a great designer/not just decorator. Very difficult and she did it well. My dream was to go to that school or Parsons, but took a different path. Love design and good design. Bathroom doors in stalls are a good point. Lighting is super important and so many details are vital to an overall look which is condusive to a comfortable setting. Very informative indeed, thank you. THANK YOU!!!! I get the same types of questions, or even worse someone will say “oh you make things pretty”….OMG…Comments like the ones you have received as well as the ones I have received, along with any other person in our profession are the many reasons why we as interior designers and interior design students have to get the knowledge out there about our field and what it really consists of. It’s not just about “making things pretty”. I have to share this! This was perfect! Thanks for sharing your thoughts, so true. Spot on!! Thank you for your contribution to understanding our shared profession. Had to share. Oh so true. Thanks for this post. There are also times when engineers or architects do not regard our profession. It happened to me once. I too am an Interior Designer and have written a similar blog regarding the confusion and seemingly interchangeable terms of designer vs. decorator. I would also add the lack of title protection acts in many states allows the term “designer” to be used even more so. Many people would believe the terms are synonymous, however depending on the project and scope of work, they quickly become differentiated. There are phenomenal decorators out there, but they cannot do the type of work designers do in the commercial setting. Great article! Thank you so much for this. I have a Bachelor’s of Science Degree in Interior Design from a CIDA Accredited program and it always frustrates me when people assume that the word design = decorating. There is so much more to design. It REALLY is a science, and therefore much more complex than picking out fabrics and furnishings. Thank you so much for clarifying the differences in such an eloquent way. I will definitely be sharing this on my social media! Thanks for your post, found it interesting and informative! Wonderfully informative article. Thanks for educating us. I hope.that some day you can come and redesign my living space to make it more appealing and functional. Love. Thank you for posting this. Great article! I am a professional Interior Designer that provides many services, that includes Interior Decorating. Love this post Kierra! Thanks for sharing because it is VERY accurate! Thank you for your comment. Just to clarify for others who may share your opinion, this article was not written to degrade decorators. I state on my “about me” page that my passion has always been more geared towards the aesthetic side of design so I would not degrade a field I am interested in. I understand that professions that are creatively inclined (music, fashion, theater, the arts, graphic design, interior design, interior decorating etc.) are often lumped into a category of being “easy” while most people do not understand how much work actually goes into your craft before the final result. 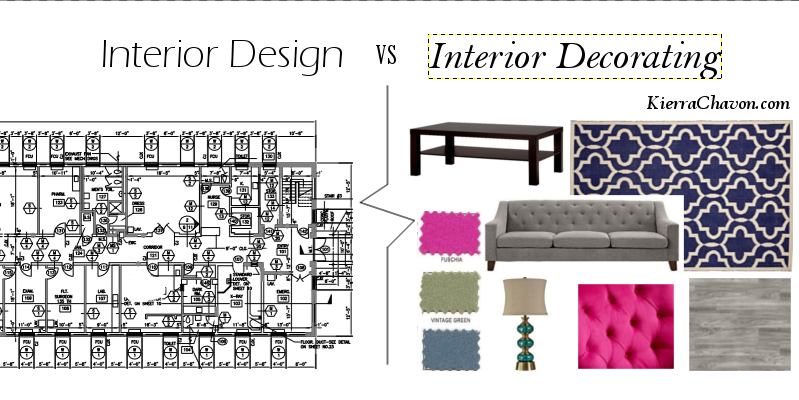 Most people lump interior design into the same category as interior decorating and these are two different fields. The purpose of this post is to bring awareness to the fact that interior design is not interior decorating and interior decorating is not interior design but it is not to say whose job is harder or more important. The overall focus of the article is interior design and what interior design is not. I think the other piece at play here is the level of education and legal responsibility of a Designer vs Decorator. I am an Interior Designer with 5 yrs post secondary with a degree from a CIDA accredited school. I am LEED accredited as well as have my NCIDQ, these require months of studying and rigorous testing. Every province/state is different but where I live, I have a handful of peers who are highly regarded Licensed Interior Designers. This gives them a similar legal responsibility to an architect when it comes to reviewing and stamping drawings to ensure compliance with building codes, fire codes and barrier free design when over a certain area dependant on building type and occupancy classification. I too, have done decorating jobs, sure they’re “fun” but also hard work. Running around, sourcing products, coordinating finishes and hardware, etc. Where the difference comes in is that Interior Design requires more technical knowledge of the building code and building construction. I’m not sure what the decorating course teaches in terms of electrical/lighting technicality or mechanical systems, but we are also responsible for coordinating these aspects to ensure they will work with the design as a whole. Understanding occupant loads, washroom counts, travel distances/exiting requirements, fire codes and barrier free design are among some of the additional aspects that add to a professional interior designers value and level of expertise. It’s not about degrading the Decorator but rather understanding the increased amount of education, experience, knowledge and responsibility that goes in to protecting the health, safety and welfare of the general public. This is what Interior Designers do. Sonja, You are spot on. We are fighting hard in Pennsylvania to be recognized and licensed as such. Thank you for clarifying the difference. I knew there was a difference but not being an interior designer I was unable to properly explain the difference to folks when they asked what my daughters major was and then would say; “Oh maybe one day she can help me decorate my house!”. This says it all and speaks the truth. Great read! This so great yes thank you for showing this! People think it’s drapes pillows and carpets . Interior design is all around us every day just not homes it’s also offices , shopping malls etc. All thoughs spaces are by interior designers ! It takes talent to make a empty space inviting make you want to be there and enjoy it! Thanks for publishing. I enjoyed the read! Thank you for pointing out the differences! I’m a much better designer than decorator. Wonderful Read! Thank you for sharing!